Build Google and Yahoo Awareness of our Site! Not Found on Google… Not YET, anyway! We have a new webpage with a brand new web address. There are over 37-million websites online… and we now have one, too. The search engines of Google, Yahoo, Bing, DuckDuckGo, and all the rest of ’em are constantly crawling through all 37-million sites looking to alphabetize and categorize the content of ALL of those pages. The web pages that have been online for years have already been thoroughly examined and sorted… and any changes made to those pages are soon discovered and updated by the search engines. The more popular pages… those with the most traffic and the most web search queries… are crawled more often than the slower/lower traffic pages. … OUR page: brand new: bottom of the list. 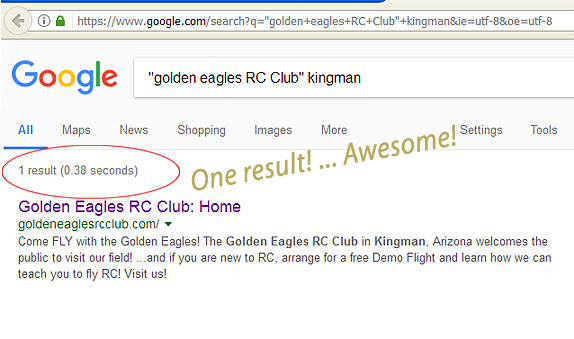 Search for Kingman RC club and you will see MANY results for the Kingman Modelers. That website has been online for YEARS and is well established in the Search Engine’s data banks. Try to remember to search every day… Google… Yahoo… any other of your favorite sites… and… someday soon, we may be FOUND on the top of Google. If you DO find a link to our site… CLICK ON IT… ! … wait a bit… and then click on some link from inside of our page… SEO likes it when readers arrive, read the page, and then click another link to see something else on those pages. So, arrive at our page, wait a half-minute while you read our page, and then click a link in the nav-bar area to see another of our pages or articles. … If you open our page and then close it or search away, that counts as a “bounce”. Search Engines count a higher bounce-rate against your SEO. They like to refer a reader to a good page, and if you immediately close the page, the Engines figure you did not see what you wanted to see. It’s all a big game… one that we can win! The web is about written words. The Search Engines evaluate a site based upon words and context. … no words or few words? … Not Found. I have been a student of SEO (Search Engine Optimization) for the last few years and I KNOW that words will tilt the scale in our favor. Repetition is beneficial…but, intentional repetition and attempting to plant “bait” for the search engines works against you… the Engines are on-alert for those kinds of tricks and tricksters will be punished (ignored) by the Engines. We need words: Let’s write! … So, we get our repetition as part of the natural, organic flow of our words. We write about our interests… the words flow… because of our subject matter the Engines get a handle on what we are writing about and so know how to categorize our site. THAT is true SEO… being properly categorized and sorted based upon our writings that come from our core enthusiasm. … If we write LOTS of good, honest content… about our club, about our models, about our events, about our batteries, engines, motors, radios, warbird races, 3D flight events, school demonstrations, parade participations, drone races and FPV fun… up-beat and positive with our enjoyment of the hobby, our community service, and our anticipation of a bright future… our place on the web at the top of Google search results will be assured! If we can be mentioned by OTHER websites, the Search Engines will see our name more often. Good SEO loves to see links between websites… if our name and a link can show-up on the sites of other groups in our city… the Powerhouse, the Boys and Girls Clubs, the Board of Realtors, the High School, the Kingman Academy of Learning, the Daily Miner, the Goodwill, any and all of those and more, our future online success will be solidified. Again… the other club’s website has been online for years and so they have a head-start on us in the SEO game… and we may never catch-up… but posting many articles, bunches of good, solid hobby info and reports of our community involvement just might get us there! YOU can write, I can help! 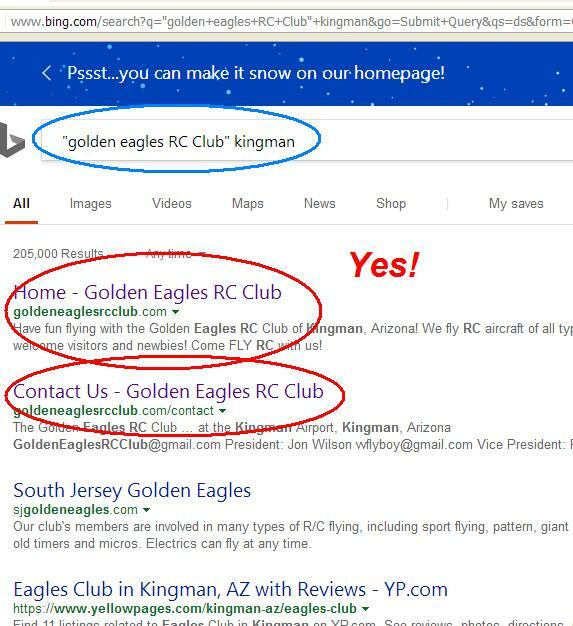 As a paid member of the Golden Eagles RC Club, YOU can write articles for our Site. Your initial login will be as a Contributor… allowing you to write your article using our online word-processor screens. The webpage Editor will help to smooth-out and enhance your work.. guaranteeing that you and your article are presented in their best light. Write about your quad-copter, your FPV experience, your latest model-build… tell us about your new battery charger… Your new foamie… how you overcame your frustration in setting-up your computer radio… tell us about learning to fly the Sport Pattern… how to take-off a tail-dragger… We don’t do politics. We do hobby and community. The future of our Club and the future of our Hobby is very exciting to think about… share your enthusiasm. GOOGLE DID find us! … Awesome! GOOGLE DID find us! … Again! REMEMBER: If you DO find us, be sure to click on the link to visit our Site. We need for the search engine to KNOW that THAT was the result you wanted. ALSO: stay on the page for at least a few seconds and then click on one of our links… like the ABOUT page… so the search engine thinks you are engaged in our content. Thank you, everyone! ← Flying RC is Fun – Join us at the Field! … or whatever other mix you can think of… remember to click our link when you find one… and then stay on our page for at least half-minute… and click a link inside our page… like Contact… the more we can train the search engines, the better! Working on other websites in the past I find the search engine are slow to find you. It’s just going to take some time. Your doing a great job Eric! 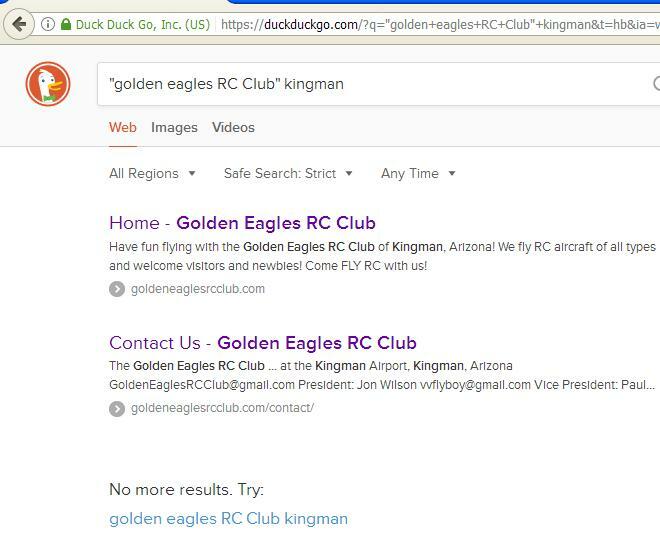 I have begun calling up AMA 5406 Golden Eagles rc club Kingman az, hopefully to move up 5406 and associate it with the Eagles, correct action?